A wellness plan when described as a part of a company usually covers several areas of employee wellness, including the physical, mental, and social / community aspects of health. A good employee wellness plan needs to include elements from all of these aspects and be appealing to all types of employees at your business. Concerned about the health and wellness of your employees? Make sure they’re getting the best health insurance plan (at the best cost to you) by using Gusto, which will give you quotes from multiple providers based on the needs of your company. Click here for a free quote. 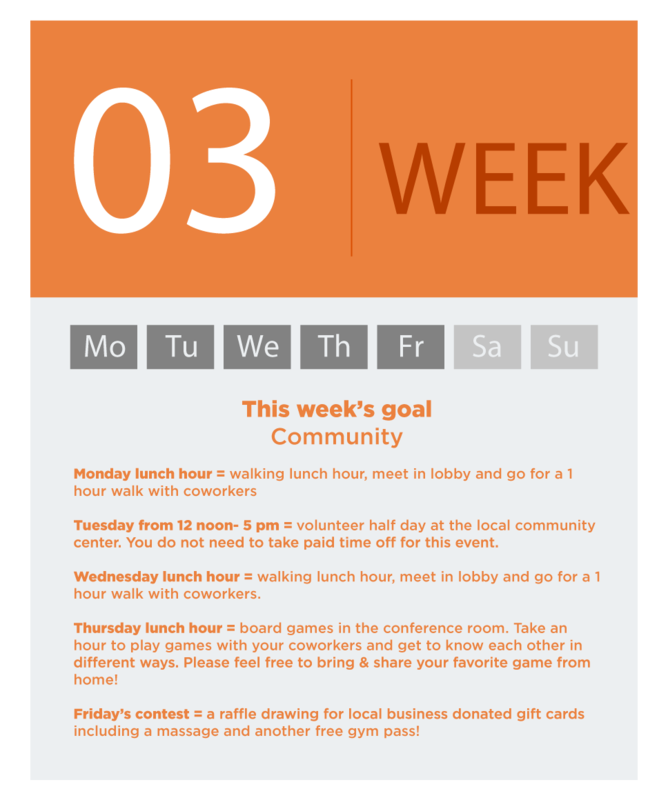 Below is a sample employee wellness calendar of events for a small business. This one is made with a very small budget in mind, and probably shakes out to $500 on the company and $10-20 on the employee if they participate in full. They have an intensive 4-16 week program that runs annually. For the best results, we recommend option 1 since, with option 2, the benefits are only experienced during that time frame. An employee wellness plan should encompass more than just physical fitness, although that is the main focus of most of them. Many companies also add in emotional wellness, healthy eating, and stress management components to create a more holistic program that also appeals to everyone. Our sample calendar includes all of these elements as well, from the book swap (stress management from reading) to walking lunch hours (physical fitness). As you begin to create your own calendar, here are 3 categories of ideas that span from free to under $20 per employee to high end wellness ideas for your small business. When something is free, employees are more likely to participate (especially if there is a wide gap in the earnings at a company). Something being free is also appealing to you as the business owner as well since cost can be a major factor in this program. Make the most of free online resources and mobile apps- everything from pedometers apps to recipe apps are out there for free! Depending on the number of employees you have and how many might participate, this section could get expensive. 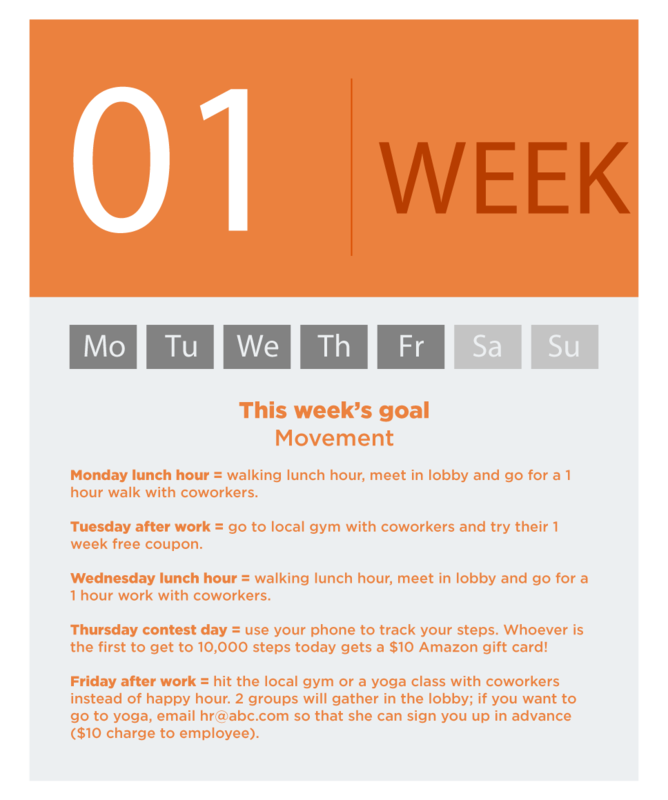 However, you don’t have to do one of these every week, but one per month would be a great way to show your employees you are investing in their wellness. Look at other classes in the area like pilates, weights, crossfit, or more. See if you can get them to provide a discount or a private class rate for your business. Provide healthy beverages on hand in the office. Each month or even weekly, have a delivery of sparkling waters and unsweetened teas delivered to your office. Provide healthy snacks. Same as above, have a delivery come with vegetable and fruit trays, or other health snacks for everyone to share. Get some lower-end company swag, like company-branded shoe laces or sweatbands. Get some company-owned wellness materials like cookbooks and create a wellness library- complete with due dates and checkout procedures! Sometimes, spending money can be a nice way to show your employees you care. Having wellness-oriented professionals of various kinds can be pricey but well worth it. Having 1 event per month like this is a nice way to round out the program. You could also pass on a small cost to participants, like $10 per employee, to soften the blow on your business owner wallet. Get some high-end company swag, like dri-fit shirts or yoga pants. Hire a massage therapist to come in and do 15 minute chair massages for everyone. Hire a chiropractor or physical therapist to come in and do spinal and ergonomic assessments on everyone and their workstations. Once you have some ideas on what you want to be included in your program, here is how you would implement an employee wellness program. Now that you know that employee wellness plans can even be done entirely for free, you are probably more inclined to get one started. 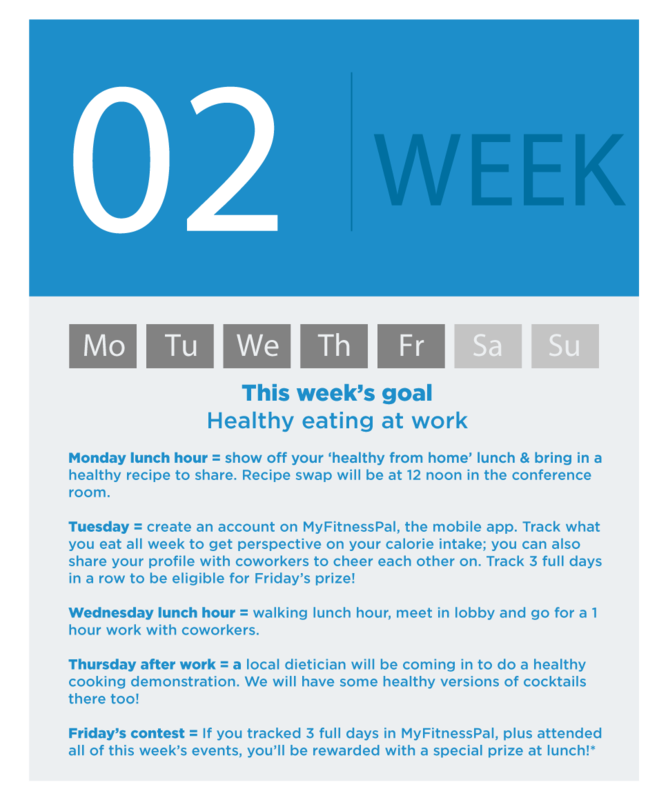 Here the the 5 steps you should take to implement an employee wellness plan. Step 1: Take an employee survey. Using a free survey tool like Survey Monkey, ask your employees about the wellness plan and a few of the ideas you have for it. How likely are they to participate in certain aspects of it and why or why not? Would they even go to a yoga class together? There is no need to plan something full out only to find your employees want something else! Increasing your employees involvement in the program by assigning them tasks can also help lighten your load in addition to running your business. Get the office fitness buff to research local gyms with free passes. Assign someone else to make a list of health lunch spots. You get the drift. Step 3: Create a calendar. 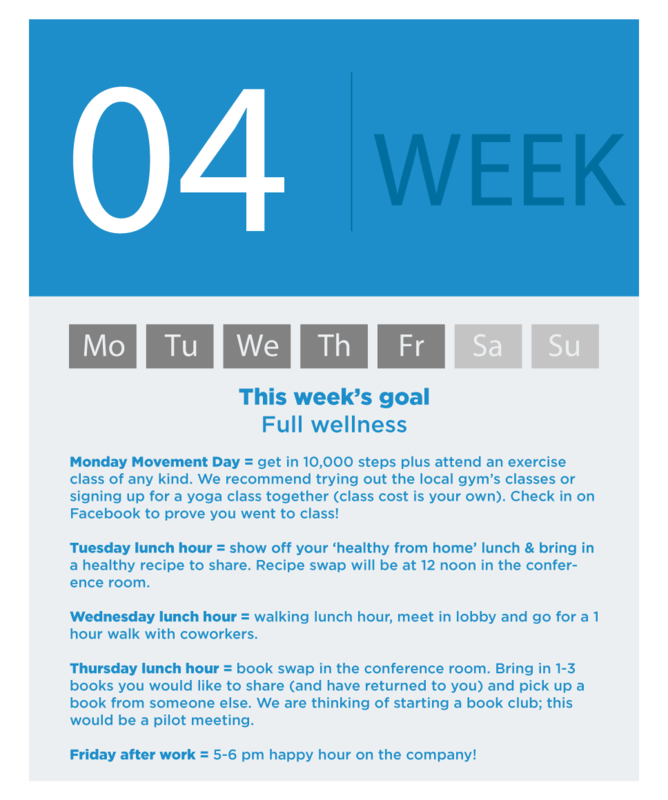 Once everyone has reported back with their findings, work to create a calendar for the following month to start the wellness program. Make sure everyone gets a copy of the calendar in advance and hang one somewhere in the office as well, like in the break room. Giving people advance notice will help to increase participation so that they can plan to attend things. Step 4: Start the program. You will want to do your best to lead by example here. Encourage people to attend, and, for the free events, maybe even allow people to bring their spouse or a non-work buddy to join. Experiment in this first month with what works and what doesn’t, and remember to take notes on how each event went! Step 5: Assess and re-evaluate. Congratulations, you made it through the first month! Assess if the plan is working or not and re-evaluate next month’s plan with another employee survey. 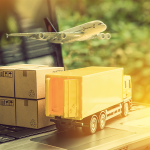 Most companies either find a set of events that works and do them on repeat all year, or some do an intense plan for 4-8 weeks long just once per year. Play with what might work for your employees. Many business owners want to make sure that the money they spend on a wellness program provides a good “return on investment” (ROI). The answer is that, when a wellness program works for the kind of employees you have, then YES, you should see an ROI from the program! Employees will be more excited to come to work, more engaged while working, and potentially even put in more hours at work in order to participate in events. Engaged and healthy employees are generally happier employees. The socialization and community aspects often get overlooked in workplace wellness programs, but their benefits can be the most powerful in reducing depression and other problems that can impact an employee’s work and their production levels. If you are considering having an employee wellness program, remember that they don’t have to be expensive or fancy to work. All that matters is that employees participate and that you as the business owner see the benefits to having one in the workplace. Having a wellness program is one of the most effective employee recognition ideas that also saves you money by encouraging a healthier and more productive staff. Don’t forget to check out Gusto, our recommended payroll provider that also provides health insurance. Click here for a free quote.